Governor Elect Steve Bullock has released his proposed state budget on the eve of the start of the Montana Legislature and his inauguration on Monday. The proposal makes modifications to the final budget submitted by outgoing Governor Brian Schweitzer, including what staff say is about $30 million dollars more in spending. “Just like budgets that we come up with around the kitchen table, a state’s budget is truly a reflection of the values and the priorities of the people of Montana,” Governor-elect Steve Bullock said Friday after walking into the expansive rotunda of the Capitol Building, flanked by top-staffers handing out thin orange books. The books contain highlights of the administration’s budget for the next two-year budget cycle. It will serve as a starting point for the State Legislature. 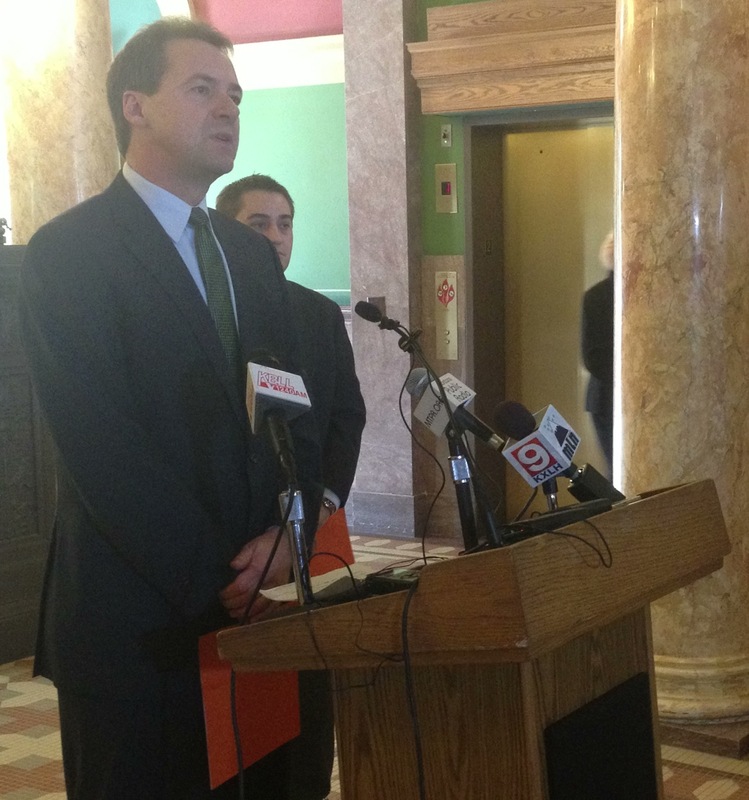 Medicaid Expansion is part of a wider initiative Bullock calls Access Health Montana. It also includes a proposal to expand opportunities for medical students and a two percent rate increase to healthcare providers. The Bullock budget includes more education spending than Governor Schweitzer’s budget while keeping in Schweitzer’s tuition freeze at state colleges and Universities. “We’ve proposed to fix the pension system,” Bullock said. The state’s two biggest employee retirement programs have large budget shortfalls, amounting to about $3 billion dollars over the next 30 years. Fixing the pensions has long been labeled a top priority for this upcoming Legislative Session. Governor-Elect Bullock’s pension fix proposal closely follows that of Governor Brian Schweitzer. It calls for higher contributions from public employees, their employers, and an infusion of revenue from natural resource development. Local governments have been skeptical of the proposal, saying it could lead to a forced increase e in property taxes. But Bullock says since election day he has earned their favor. “I’m happy to announce the Montana Association of Counties and the Montana League of Cities and Towns will join my administration… in putting forward a solution to the public employee retirement system that I think we can all support,” Bullock said. Republican Speaker of the House Mark Blasdel is not ready to go that far. “I think it’s a step in the process,” he said. Blasdel and lawmakers received the proposed budget at the same time as the press this morning. “I’ve just briefly gotten to look at it, we welcome the Governor’s ideas,” Blasdel said. He stopped short of outright endorsing or opposing priorities in the budget. Yet, he says Republicans support a form of permanent property tax relief rather than the one-time $400 dollar property tax refund present in the Bullock budget. “If you look over the last few bienniums there’s been a surplus in most of them which means the taxpayers have over-performed,” Blasdel said. Republican leadership has also been cold to the idea of Medicaid Expansion, not wanting to rely on the large financial support provided from the federal government. But leaders say they are still optimistic they will find common ground. Blasdel says he needs to be a little vague in responding to the budget, considering the amount of discussion yet to come. Blasdel says he hopes this Legislative Session, and the Republican caucus remains focused. “Focus on bills that you think the Governor can sign, work with people that you may have not worked with in the past, to see if there’s some kind of compromise without compromising your values as well,” he said. That search for compromise begins Monday, when the 63rd Montana Legislature convenes. This entry was posted in 2013 Legislature and tagged 2013 Legislature, Mark Blasdel, Medicaid Expansion, State Budget, state pension funds, Steve Bullock by Dan Boyce. Bookmark the permalink. Does prisons for profit really reflect the values and the priorities of the people of Montana? I think not….from what I am hearing across the board most Montanans have not even realized what has been happening. within their justice system. But that is starting to change.